TWENTY-SECOND DAY. --ALMS-GIVING AFFORDS GREAT RELIEF TO THE DEPARTED. Prayer: Lord! Graciously look down upon the alms we offer for the redemption of the captive souls in Purgatory. Bestow upon them the full merit thereof, that they may be able to discharge their debt; accept, we beseech Thee, this boon of charity, that delivered from debt and penalty, Thou mayest lead them into Thy Heavenly Kingdom. Through Christ, our Lord. Amen. 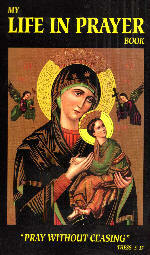 Special Intercession: Pray for the souls of those who upon earth gave alms for the relief of the suffering souls. Practice: Bestow a gift upon a poor person, and offer the merit for the souls in Purgatory.